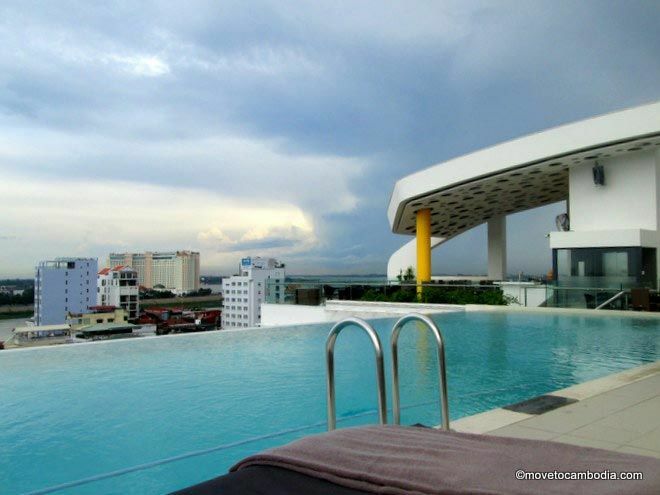 Sun & Moon is a stylish modern hotel with stunning rooftop pool. The Sun & Moon Urban Hotel in Phnom Penh is sleekly modern on the outside, lit up at night with glowing pinks and blues, and the lobby looks like it was transplanted from a trendy upmarket hotel somewhere in London—although most such hotels in London probably don’t have somewhat kitschy (and quite pricey) Cambodia-themed art on the lobby walls, nor offer it for sale. Looking for an urban retreat? Sun & Moon Hotel has an excellent Riverside neighborhood location. An open atrium rising above a garden full of greenery fills the hotel with natural light and air—no walking down stuffy, dimly lit corridors to get to your room. Perhaps no one told the architects about rainy season, though, because unfortunately the hotel is also open to wind and rain. During a shower the floor gets quite wet, and you will, too, if you venture into the hallway. Strategically placed sandbags aim to prevent flooding but detract a bit from the hotel’s contemporary design. The hotel’s 80 rooms offer a choice of deluxe king, deluxe twin, suite king without balcony, and suite king with balcony. There is also one apartment. 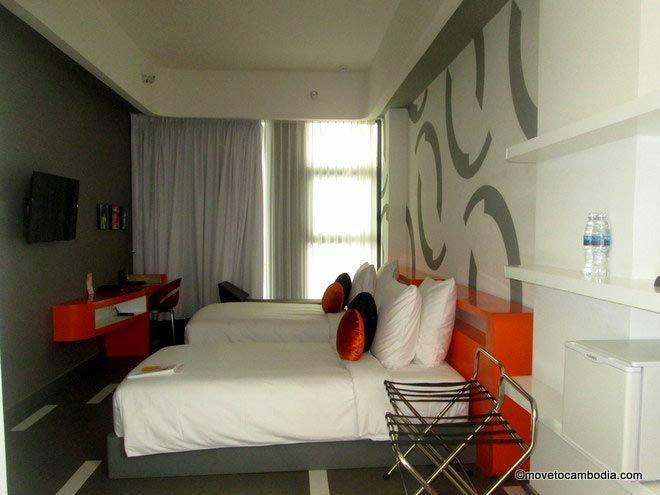 Like the hotel’s public areas, the rooms are aggressively modern, white with hard-edge splashes of bold color. All rooms are ensuite and air conditioned and come with a flat screen TV, safe, robes and slippers, tea- and coffee-making facilities, a mini-fridge (not a mini-bar), and complimentary water. There’s free wifi throughout. Not the most stunning photo, but you get the idea. A notable feature of the bathrooms is that the shower and toilet are each in separate roomlets off a spacious sink area with natural light—not necessarily a good thing, however, if you like a blacked- out room in the morning. Among the hotel’s many amenities, the standout is the rooftop infinity pool with views across the city and a rooftop bar, called Cloud 9, for savoring the sights over a cocktail or two. You’re paying for the view, though; cocktail prices start at $4.75. There’s also a gym and a spa with sauna, steam room, and jacuzzi, plus meeting rooms for those coming to the hotel on business. Down in the ground-floor lobby area is another watering hole, the Unplug Bar, and the Salt N/ Pepper Gastro Pub, where despite we had a very good breakfast with service to match. And on the “auspicious” eighth floor there’s #8, a VIP Lounge that offers live entertainment. Wait for the glowing hotel exterior at Sun & Moon after dusk. 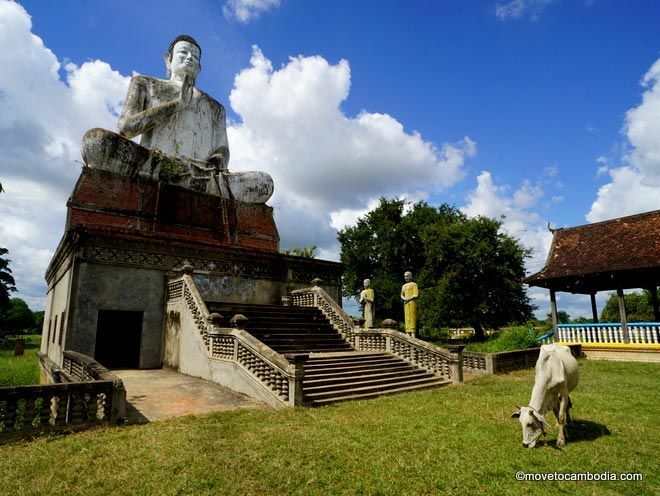 To some the hotel’s superb location will be just as important as its facilities. 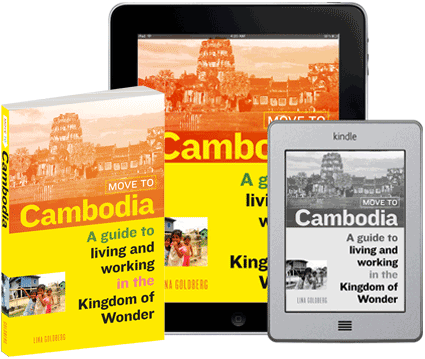 It’s a two-minute tuk tuk ride from the Giant Ibis Bus terminal and a three-minute walk to the Riverside’s bars and restaurants, and the Central Market, the Sorya shopping mall, the National Museum, and the Royal Palace are all nearby. The location and all the pizzazz come with a price, of course. On Agoda, Sun & Moon’s rooms start from around $70, with breakfast included; the walk-in rate is $79. The hotel’s website offers various promotions and offers (including room-only prices), depending on when you want to stay and for how long, so check it out before you book. 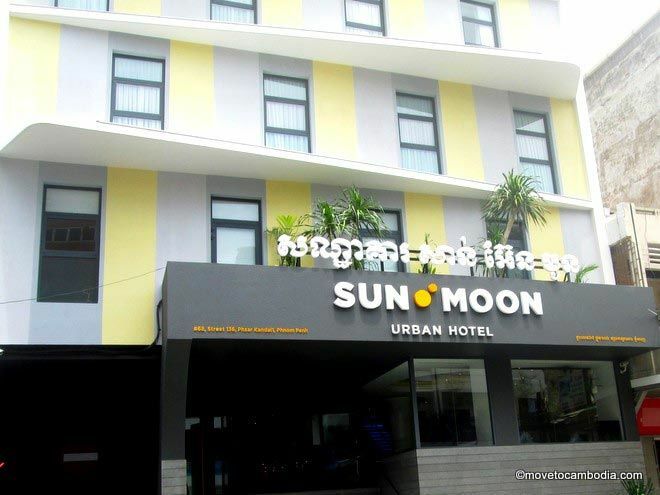 → Check prices and book a room at The Sun & Moon Urban Hotel on Booking.com or Agoda now. We may (or may not) earn commission on sales made through some links on this page. For more information about our policies, please see the disclosures section of our About Us page.